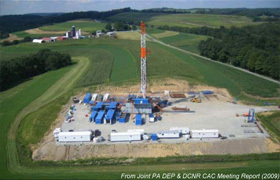 Groundwater Sciences Corporation (GSC), with offices in Harrisburg, Pennsylvania, Vestal and Beacon, New York, offers services key to the development of the Marcellus Shale. Since 1987, GSC has supported industrial, commercial, mining, petroleum and municipal clients with technical expertise and regulatory/permitting experience regarding water supply and waste disposal. We have developed and implemented many home-owner water supply well sampling programs, some in especially sensitive circumstances involving state and federal Superfund sites.